I have been asked to create a model of a cable, wound in a series of layers onto a spool, like a winch cable onto a drum. The smart money says 'Don't do it', because it will take an age to regenerate. I know that. However, I want to know how to do it anyway. I'm curious like that. 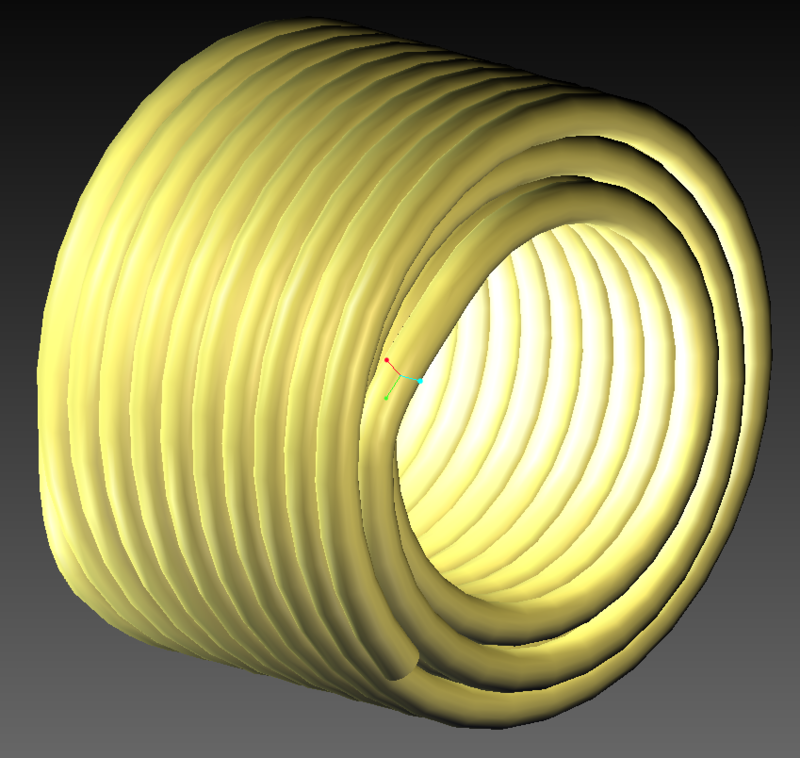 For each layer, I reversed the z direction, incremented the r value and started theta with an offset so I could fake the join between layers using a curve between points, tangent at each end to the spiral curves. Once I had a series of coiled layers and joins between them, I tried to Copy, Paste, Approximate, the curves to make the whole ugly mess into a single composite curve. No! Can't do that. No idea why not, but Pro/E insists they should all remain separate curves. So, then I made a series of separate VSS features, one for each layer and one for each joining piece. However, what I would ultimately like to do is to have the whole cable as a singe curve and control the number of layers by making the overall curve length a fixed value. So, if I tell it that 10m of cable is paid out from the winch, I want to have the remainder shown coiled up on the drum. I therefore tried to write an equation for all the layers. Now, I'm no programmer and I'm doing this in the Pro/Table editor that starts up when you insert a datum curve from equation, so I am working with a bit of a handicap to start with. 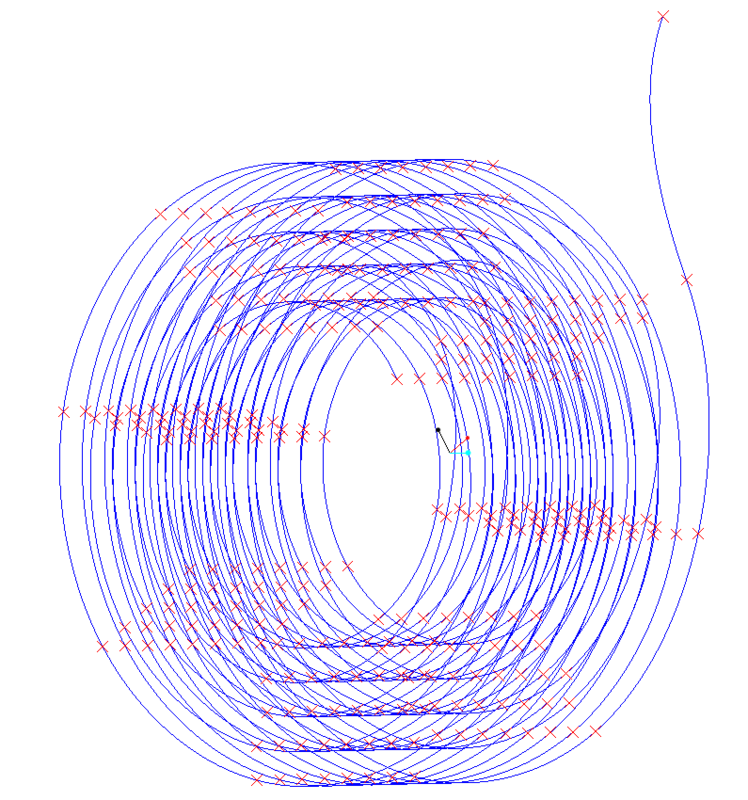 Clearly, I want to increment my radius by the pitch value and reverse my z direction each time my theta reaches no_of_turns*360. Problem is, Pro/Help tells me I can't use the ABS, FLOOR or CEIL functions in a curve equation. Is it, therefore, even possible to do what I am trying to do with a single equation? If not, is it possible to combine all my separate curves into a single composite curve, despite what Pro/E tells me? I look forward to your comments on this interesting little conundrum. So, the <Shift> key is the one-by-one selection within the composite curve collection and it will only let you select curves that are touching one another. 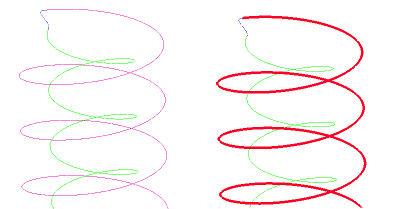 In the image the pink and green curves are equation driven and the blue one is a point to point curve with tangency joining them together, I can create them as one composite curve with the <Shift> key. · Then you need to move your mouse slightly and select again and it will turn into a fuzzy red highlight – as shown. · Now <Ctrl> C and <Ctrl> V to copy and paste and you will be in the composite curve definition and the <Shift> key should stitch them together. I don't know the answer without some more serious equations but I will congratulate you on this accomplishment. Thanks for sharing! Today, I have tried a different route: I made a spreadsheet to calculate the r, theta & z values and used it to create a datum point feature, then made a single curve and a VSS to make the cable reel. That's fine, but not easy to modify when values change. Extra steps, exporting the points and changing file names, etc. I would like to pursue the original method, with a number of separate curves, but I think I really need to be able to combine them all into one single curve, so that I can play tunes on overall length and cable tails, etc., without it all falling over. Am I missing a way to combine a number of composite curves into a single composite curve? Come on, Charlotte, you must know the answer to this one! I think that you issue might be the approximate that you went for? Will it allow you to create the curve with exact? I have some equation curves, through point curves, composite curves in a model and I can create composite curves of bits of them and then string a bunch of composite curves together into one conposite curve so it is definitely allowed to join multiple composite curves together. If I select one of my equation curves, it won't let me shift-click another curve, only ctrl-click. 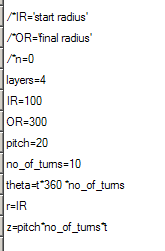 If I copy, paste the ctrl-click collection, I just get individual copies of the individual curves. I thought I had to shift-click a couple of curves, copy, paste, approximate in order to get a single composite curve made up of the two individual curves. Clearly, I was wrong! Applications, Legacy, Insert, Model Datum, Curve, Composite, Done, Exact, Done, One By One, ctrl-Select the curves, Done a few times. Now why did I not think of that? Now, is there a way to get there with the current (WF4) UI? Well, now that I have had the opportunity to have a good look at your curves, they are very nice, too! Where I was going wrong was in thinking that I needed to select both curves before I did ctrl-C.
Now I have done it all in the right order, it works perfectly. Thanks, Charlotte, I'm very grateful. I devised it for springs, but anything that is wound would work the same.